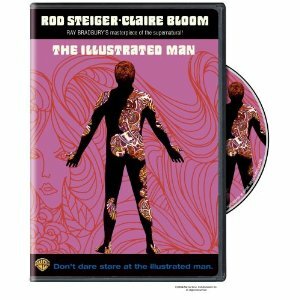 The Illustrated Man (1969) starring Rod Steiger, Claire Bloom and Robert Drivas is based on the Ray Bradbury book. While not technically a horror movie, it is filled with tension and is about a man (Steiger) who is haunted by the past when he let a former lover (Bloom) tattoo his entire body from his neck to his toes. Steiger's character runs across a drifter (Drivas) off a back road near a lake where they camp out. The Illustrated Man warns the drifter not to look too long at his skin illustrations ("don't call them tattoos!") because they come alive and tell you stories and you may see your future - even your death! He also tells the drifter how he met the woman and how he let her do this to him. He's now trying to find her so he can kill her but he says she may have gone back to the future. Of course, in addition to listening to his story, the drifter does look at the illustrations and he & we see different stories all starring the same actors. We see 3 different stories (all taking place in the future): "The Veldt" takes place in a futuristic home where the children's nursery is like a Star Trek holodeck and much to the dismay of the parents (and mental health adviser) the children's inner thoughts are causing a menacing atmosphere including hungry lions and buzzards. "The Long Rains" is about a rocket ship that crashes on a planet where there is constantly a downpour of rain. The surviving astronauts have to survive long enough so they can make it to one of the "sun domes" scattered across the planet. The pounding rain drives the astronauts to the edge of insanity and beyond. "The Last Night of the World" takes place on a future Earth where only a handful of survivors live rather idyllic lives but suddenly all at once all have the same vision that the world will end on a certain day. The world's male population meets and decides that the vision is true and in order to spare the children having to face the horrible end, they will put them to sleep. When the man comes home and tells the wife this, she of course refuses to do it. You'll have to see the movie (or read the book) to see what happens. Ray Bradbury stories are always thoughtful and often blend creepiness and science fiction into an always interesting story. This movie based on his work is no exception and Steiger brings an extra level of tension and menace to the story his illustrated body tells.